In this age of electronic assistants, it is hard for many to fathom a time when telephone service was limited and mail, or what today is referred to as “snail mail”, was the order of the day. During the early decades of the twentieth century written letters were the most common form of communication, and letter writing was an art. Desks provided the storage space for the accoutrements of writing, including the sundry items in this Favrile glass desk set by Louis Comfort Tiffany. Included are: a pen wipe, box, inkwell, letter file, blotter, and pen tray. Even the process of writing required numerous utensils, since writing with liquid ink flowing freely from a fountain pen could be quite messy. Each of these items served its own purpose, from the pen wipe that was used to remove excess ink from the nib of the pen, to the blotter that absorbed excess ink from the written page. 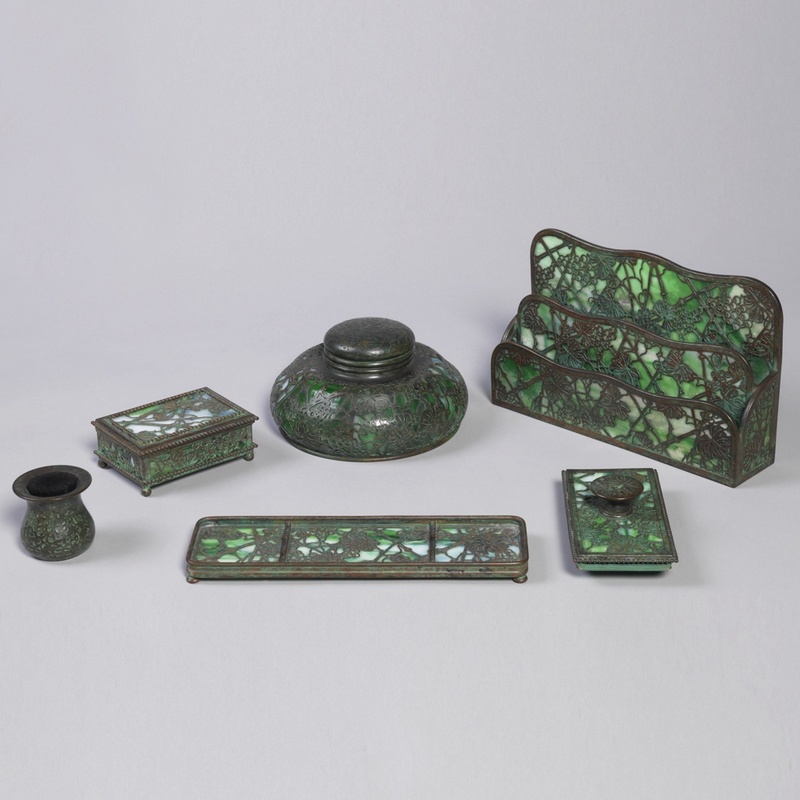 Although totally utilitarian, these items, with their rich green glass and etched bronze grape and vine overlays rendered in an Art Nouveau style, added a touch of beauty to whatever desk they rested upon. Favrile glass is a type of iridescent art glass developed by Louis Comfort Tiffany. He patented this process in 1894 and first produced the glass for manufacture in 1896 in Queens, New York. It differs from most iridescent glass because the color is not just on the glass surface, but in the material itself. Favrile glass also has a distinctive, often intense coloring. Tiffany won the grand prize at the 1900 Paris Exposition for his Favrile glass. It was first shown to the public in 1893, and in pieces that were produced a few years later Tiffany achieved an outstanding expression of the Art Nouveau style. Tiffany’s Favrile glass was used for stained glass windows that were incorporated in large scale architectural projects of the time. This prized glass grew in popularity and Tiffany began to use it in home products like this desk set, clocks, and lamps. Favrile glass was produced from the mid-1890s through 1933. Susan Teichman is a design historian specializing in jewelry design and synagogue architecture.